FACT CHECK: Were Some Voters' Absentee Ballots Returned as 'Undeliverable'? Reports out of Ohio and Georgia claimed that ballots mailed in government-provided envelopes were rejected by the USPS. 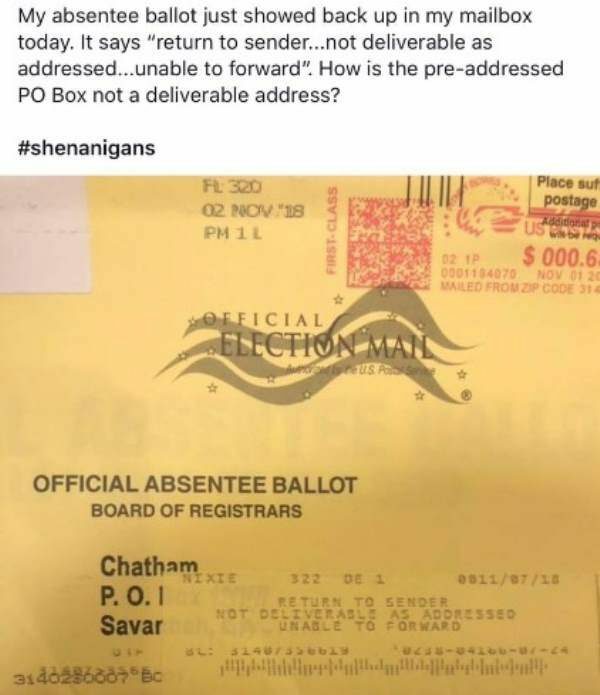 A voter in Chatham County, Georgia, had a mail-in ballot returned and listed as "undeliverable" even though it was addressed to a county-approved P.O. box. Amid the dispute over reputed voter suppression efforts in the 2018 gubernatorial election in Georgia, officials in one county said they would investigate an apparent issue that was first highlighted on social media. My absentee ballot just showed up in my mailbox today. It says “return to sender … not deliverable as addressed … unable to forward.” How is the pre-addressed PO Box not a deliverable address? As the post was disseminated online, other users claimed that no mail-in ballots had been recorded in Chatham County at all, which was not true. County election supervisor Russell Bridges confirmed to us via email that officials received around 6,000 mail-in ballots, and the county election board’s website shows that mail-in ballots were indeed cast and counted throughout the area. At least one voter in Ohio reported that her own absentee ballot was also returned with a notation reading “Insufficient address,” despite her use of the envelope provided to her by the Medina County elections board. Overall in Georgia, around 230,000 ballots were reportedly mailed in during the 2018 electoral season, with more than 5,000 being rejected for various reasons. However, judges ruled in two separate cases that ballots with incorrect or missing birth dates, as well as those with “mismatched” signatures, were to be counted. Republican Party gubernatorial candidate Brian Kemp was widely criticized during the election for refusing to step down from his position as Georgia secretary of state (which oversees election issues) until after he declared himself the victor over Democrat Stacey Abrams. Kemp was also had been accused of engaging in voter suppression ever since he took office as secretary of state in 2012, particularly after reports that his office had canceled around 670,000 voter registrations in 2017, and more than 1.4 million voter registrations overall during his tenure. The Washington Post. 16 November 2018. Atlanta Journal-Constitution. 16 November 2018.